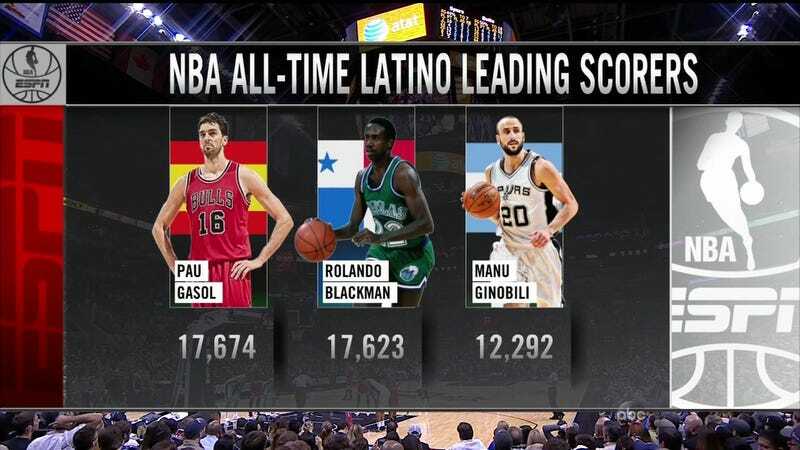 ESPN/ABC ran this graphic during today's Bulls-Spurs game in recognition of the NBA's Noche Latina campaign, and it raises an interesting question: does Pau Gasol belong on this list? The U.S. Census Bureau says yes—as does the Office of Management and Budget, which says "Hispanic or Latino" means someone whose ethnicity derives from "any Spanish-speaking area." Plenty of people disagree—stating that a Spaniard like Gasol may be Latin, but is not Latino, because "Latino" is an abbreviation of "Latin American," which would dictate New World origins. Did ESPN/ABC get it right? Argue below. Update: Should Carmelo Anthony actually be first on this list? Reader Amir reminds us that 'Melo's father is from Puerto Rico.